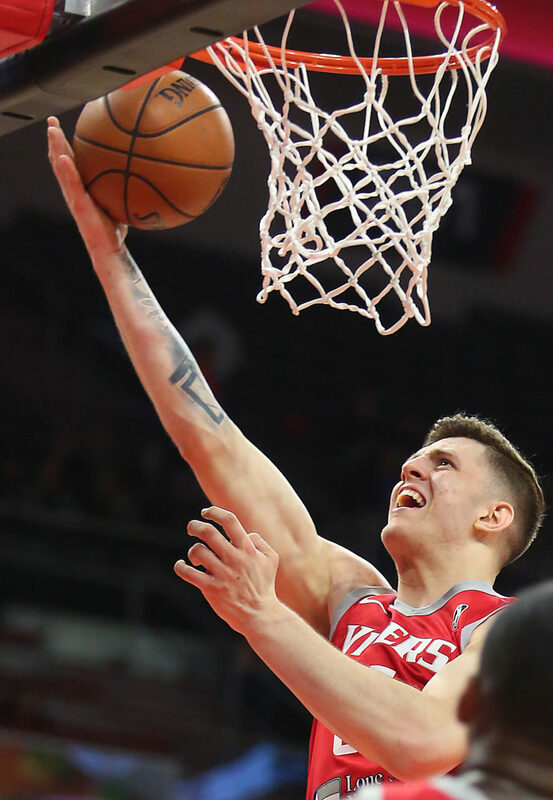 One of the reasons for the Rio Grande Valley Vipers successful season has been the contributions of Isaiah Hartenstein, who has been recognized as an All-NBA G-League Second Team selection. The award was based on regular season statistics as Hartenstein played and started 26 games for the Vipers. He averaged 19.5 points, 14.7 rebounds, 3.8 assists and 2.0 blocks over 32 minutes per game. Blair felt the reason for those numbers were the result of the 7-foot, 249-pound center being able to adapt to the RGV style of offense. He was the 43rd overall pick in the second round of the Houston Rockets in the 2017 NBA Draft. This season, Hartenstein has also appeared in 28 games for the Rockets, who are affiliated with the Vipers, where he totaled 1.9 points and 1.7 boards per contest. He feels all this travel can sometimes be a hassle; he was assigned to the Vipers nine times between December and the end of March. Hartenstein was a professional player in Germany and Lithuania as a teenager. He also was honored as the G-League Player of the Month in January so that is why he might be a little anxious to make the permanent move to the NBA. Hartenstein started four games for Houston in the 2018 NBA Summer League in Las Vegas where he averaged 10.3 points and eight rebounds in 22 minutes per game. He also played for the Rockets in the 2017 NBA Summer League. Hartenstein played 38 games for the Vipers during 2017-18 when he averaged 9.5 points and 6.6 rebounds in almost 19 minutes of action. He feels his numbers improved this year by playing better in the system. Rockets starting center Clint Capela has been a mentor for Hartenstein. Capela, the former Viper and a native of Switzerland, was on the sidelines for 15 games, prior to the NBA All-Star break, with a right thumb injury and Hartenstein was on the Houston roster for part of that time. Hartenstein’s father, Florian, played basketball at Oregon and later professionally in Germany. The younger Hartenstein was born in Oregon but moved to Germany with his family at age 11. A right Achilles soreness sidelined Hartenstein for the second half of the Vipers home game with Stockton on March 8 plus the next eight Rockets games but he’s back on the court and just waiting to see what his role will be for the Rockets in the playoffs.